Chocolate-dipped pretzels are a quick and easy treat that kids can help make. Recipe developed by Gale Gand, a nationally acclaimed pastry chef, restaurateur, cookbook author and television personality. Prepare Red Colored Sugar. Set aside. Place chocolates in 3 separate 1-cup glass measuring cups. Melt chocolates as directed on package. Dip each pretzel rod into melted chocolate, tilting glass so that half of the pretzel rod is covered in chocolate. Allow excess chocolate to drip off. 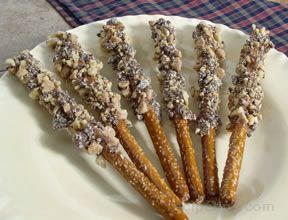 Holding chocolate-dipped pretzel rod over a plate of Red Colored Sugar or crushed candies, spoon sugar or candies over pretzel while turning to coat evenly. Place pretzels on wax paper-lined tray. 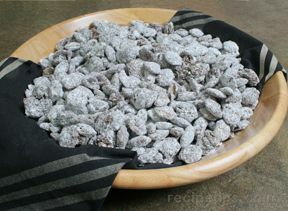 To make 1/2 cup crushed candies, you will need about 25 peppermint candies. Place peppermint candies in large resealable plastic bag. Close bag tightly. Pound with rolling pin, mallet or heavy skillet until coarsely crushed. Or, process in food processor using pulsing action.